The 2017-18 season has begun! Several of my recent blog posts have looked at standings projections, but we're going to look at just a few more. First, is the final projection by Dom Luszczyszyn of the Athletic (@domluszczyszyn). It will probably surprise non-analytics fans to see Edmonton so low, and for analytics fans to see Detroit and San Jose so low, and Tampa Bay so high. Beyond that, I don't think that there are too many head-scratchers here, so this should serve as a pretty good reference point about what expectations were at the start of the season, roughly. 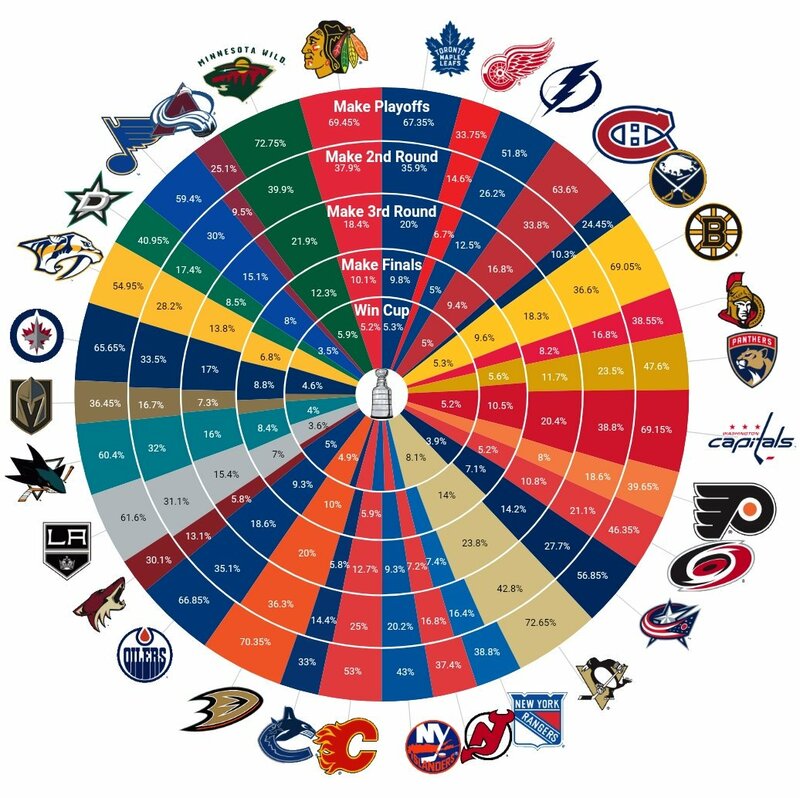 And, Colin Cudmore (@CudmoreColin) figured out how the odds of how many Canadian teams will make the playoffs, based on Micah Blake McCurdy's projection model (which we covered in last week's blog post). Nothing terribly surprising here. As for me, I took a closer look at players who were on a PTO. By my count, only eight of them signed a contract, give or take maybe one. Of them, it sounds like people are expecting the greatest impact from Cody Franson. Me? I think it will be Daniel Winnik. I wrote up my thoughts on Winnik, Franson, and the others for NHL.com (link). I also took a look at Jagr for NHL.com, and what we can expect from him this season (link). I figure he could crack the 40 point mark again, because his 5-on-5 scoring rate is just incredible. It might slump due to age, and due to being placed on the third line with Versteeg and Bennett instead of the top line in Florida with Barkov and Huberdeau, but we'll see. There's also room for him to get more points on the power play. Most fans seem to agree with this optimistic assessment of his scoring potential this season. I also think it's crazy that Jagr signed for only $1.0 million. Consider all the solid veterans who signed for $1.0 million this summer, including Jokinen, Cammalleri, Sharp, Hemsky, Desharnais, Jagr, and so many others. Given that rather mediocre, shot-blocking #4 defensemen really cashed in to lucrative long-term deals, you really have to wonder what's going on in NHL front offices. Maybe it's just a supply and demand thing. Speaking of the summer, I have also marveled at how the Arizona Coyotes have transformed their top four from one of the league's worst, to one of the best. In 2015-16, Ekman-Larrson was joined by Mike Stone, Connor Murphy, and Zbynek Michalek. Two years later, and OEL is joined by Alex Goligoski, Niklas Hjalmarsson, and Jason Demers. Good gravy, that's a big improvement. It reminds me of the Tampa Bay Lightning from years ago, which also used trades and free agency to build a really good blue line. Nashville built a great blue line too, but did it through the draft, before making the big Weber-for-Subban trade. The commonality in all three situations is that they each had a franchise defenseman already. But, the point is that blue lines can be rebuilt, and there are blueprints for doing so. There's no reason to have a terrible blue line forever. As for the next great blue lines, perhaps we can keep our eyes on Carolina and/or Philadelphia. I also started looking through the historical data on NHL.com. In case you missed it, they added a LOT of historical data to their database. I'm sure I'll be spending a lot of time going through all of this, but first here's a look at the best goalies of the pre-expansion era. Is that pretty much how you would have had it? Finally, here's a neat tool from Ice Thetics (@icethetics). 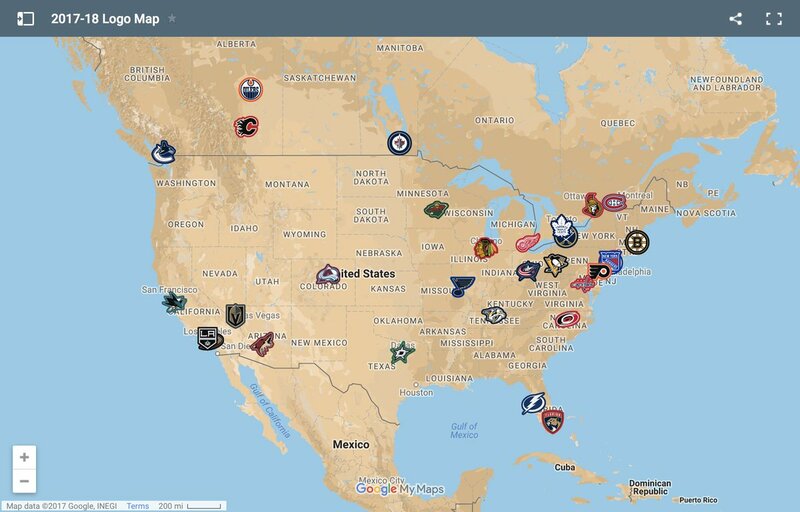 It's a logo map so you can see where all the teams are located. This one is just the NHL, but you can add all the other teams and see where they're really concentrated.